When Floyd Mayweather fights, you're guaranteed a big main event, but the undercard doesn't always match up. Tonights undercard definitely delivers. In fact, the undercard fight of Shane Msoley vs Saul Alvarez is so good that it could head a boxing card of its own. There is a lot at stake here. Saul Alvarez is unbeaten in 39 and he's picking up steam after wins over Kermit Cintron and Matthew Hatton in the last year, but the Mexican star needs a special performance tonight to get his leg over the fence and onto the next level. He doesn't want to be part of a mega-fight card, he wants to star in one. He needs nothing less than a knockout win tonight. Similarly, Shane Mosley has a lot to win but everything to lose from tonights fight. He's forty years old and on a run of 3 losses and 1 draw in his last six fights. At his age, the doubters start to mention retirement. Mosley needs to beat the kid from Mexico and prove to the world that he is still a world-class fighter. 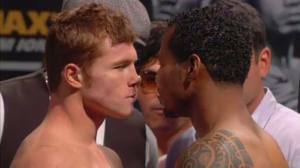 So, what time does Saul Alvarez fight Shane Mosley? For UK viewers, the main event of Mayweather vs Cotto is 5AM. For the undercard fight of Mosley - Alvarez, you're looking at 3-3.30AM (ish). Obviously I can't give an exact time, because fight organisers run to their own schedule. If you're sat in front of the TV at 3-3.30 AM you should be okay. Enjoy the fight.